A longtime teaching pro at Amsterdam Billiard Club in New York City, Tony has dozens of regional and national titles to his name, including the 2004 BCA Open Championships. ONE OF the most common misconceptions I hear from beginning students concerns a the draw stroke. Again and again, I'll have a someone new to the game ask, "Is it true that you get more draw on a shot when you pull the cue back right after it hits the cue ball?" Not only is this untrue, but it's actually counterproductive to learning how to draw the cue ball properly. By pulling back after impact, you limit the amount of speed you can transfer to the cue ball, which limits the distance you can draw the ball. Also, to stop your cue after impact, you have to clench your back hand, which can cause a whole different set of problems. When I work with my students, I tell them that there are a lot of people who mean well; but unfortunately, sometimes the information that they give out is so far off base it's not even close to being true. I was once instructing a fairly advanced player who believed that this abbreviated follow-through was the best way to create draw. When we started working on letting the cue travel through the cue ball, he told me that, when he was a kid, his grandfather said that he could rip the cloth if he ever followed through on a draw shot. So, he never followed through. After 45 minutes of practice, I had him drawing the ball better than he had in his whole life. Sometimes it's just a matter of letting go of bad habits. 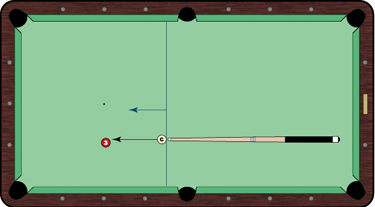 As an exercise, set up a cue ball and object ball as shown in Diagram 1. The distance between the two balls should be about a foot. Also, make sure the shot is at a slight angle, so you can stroke through the ball without worrying about it coming straight back at you. Finally, mark the locations of the balls with a piece of chalk. After every shot, look to see where the tip of your cue came to a rest, this is the distance of your follow-through. Also worth noting, there is not one magic distance you should aim for. The harder the shot, the longer the follow-through. The softer the shot, the softer it is.